This list contains information about celebrities who own fish tanks, loosely ranked by fame and popularity. Expensive and elaborate fish tanks are a status symbol amongst some of the top celebrities in the world. Famous actors, musicians and athletes all own lavish aquariums. One famous pop singer even has a fish tank in the trunk of his car. Who is the most famous person who has a fish tank? Madonna tops our list. She reportedly has an expensive luxury exotic fish tank in her home. Other famous female singers who own expensive fish tanks include Mariah Carey and Cher. Steven Spielberg has an aquarium in his office. Several famous athletes have fish tanks. Chad Ochocinco has fish tanks around his bed and surrounding his televisions. Roy Williams showed off his impressive fish tank on an episode of MTV's "Cribs." Kanye West had a 250-gallon aquarium at the end of his bathtub, before he married Kim Kardashian. Usher has an Acrylic Tank Manufacturing fish tank in the trunk of his car. If you were a celebrity, what type of fish tank would you want in your home? Share your thoughts in the comments section. Madonna reportedly has an expensive luxury exotic fish tank. Mariah Carey is amongst the list of celebrities with lavish fish tanks. Kanye West had a 250-gallon aquarium at the end of his bathtub. 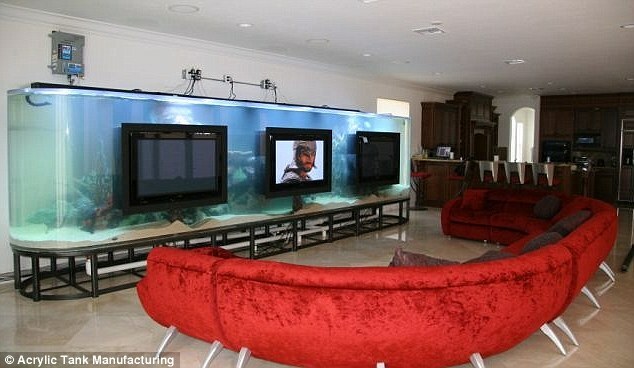 Chad Ochocinco has fish tanks around his bed and surrounding his televisions.